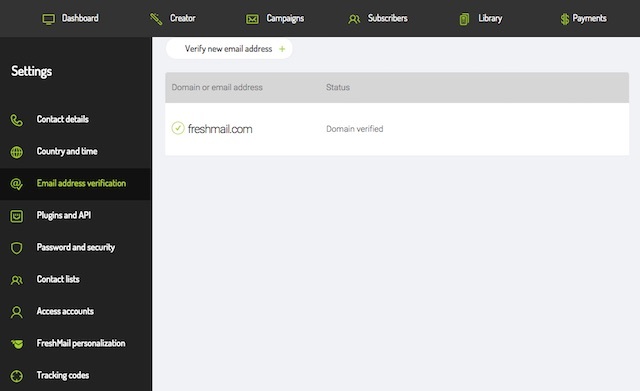 FreshMail is proud to adhere to policies and standards that are consistent with email marketing good practices. This is why we verify that the 'From' address that you use in your campaigns is in fact in a domain that you have access to. This practice prevents senders from using addresses that do not belong to them and assures recipients of the proper identity of the authors of emails they receive. Authenticating 'From' addresses helps you to achieve higher open rates and delivery statistics by making sure that your messages are not directed to spam folders. How can you verify your addresses? Enter the ‘Settings’ on your account. Then select ‘Email address verification’ on the tab list on the left hand side. On the panel that you will see all your verified addresses and domains and those that you have submitted for verification but have not been approved yet. If you want to add new addresses to your account, use the ‘Verify new email address’ option. A new window will appear in which you will have to enter the new address that you want to use to send your newsletters from. In order for the verification to be properly executed, you will have to click on the link that you will receive from us automatically after submitted the address for verification. 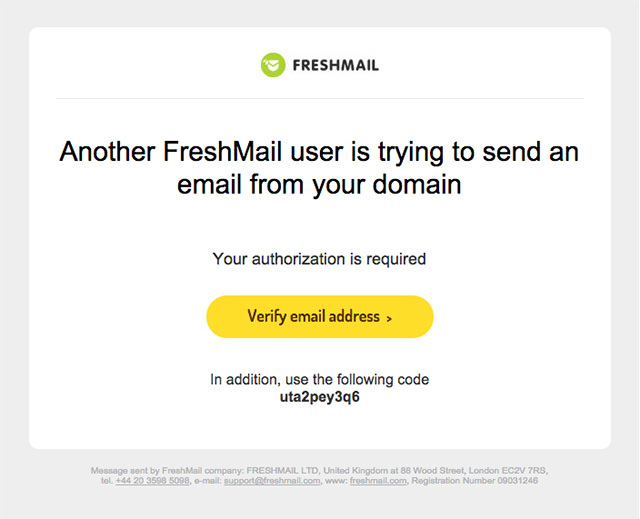 If you don’t click on the confirmation link sent in FreshMail’s email to you, the domain will be marked in the account as unverified and it won’t be possible to use it to send campaigns. Remember that during the process it’s not possible to verify the domains of email services like Gmail or Yahoo!. In this case you can only verify the single email address that you have access to. If you have any questions and problems contact our Customer Service.